Amphibians are vertebrates which transition from a young state of water breathing to the adult state of air breathing. They include species like frogs, toads, salamanders and newts. Amphibians underwent an evolution process originating in the Devonian period (416 to 359 million years ago). They were highly skilled predators in subsequent ages known as the Carboniferous (359 to 299 million years ago) and Permian (299 to 255 million years ago). There are 6,433 species of amphibians out of which most pertain to frogs and toads family: 5,679 species. Salamander family comprises 580 species. The rest of 174 species is made of amphibians which look like earthworms. Frogs cover various environments from the tropics to sub arctic regions. Although they have adapted to even harsher habitats, most of them can be found in tropical rainforests. Many species are facing extinction because of this. People have reverted to deforestation – largely giving into pressure from large multinational corporations – to make way for new homes, agriculture and industry. Efforts are being made to preserve the environment by organizations all over the world but the pressure from the powerful multinational interests have continued unabated. Unfortunately for many species it is already too late as the world is going through the largest mass extinction cycle since the dinosaurs. Frogs prefer humid areas because their skin is permeable and they can keep themselves hydrated more easily. 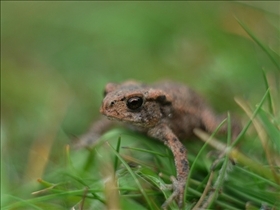 Toads can be found in arid areas as well as in tropical rainforests. Examples of toads have been revealed in the deserts of Australia and Arizona where the toads lay dormant in the dry sandy soil waiting for the rainy season when their bodies are rehydrated by rainwater beginning the cycle of digging to the surface, reproducing as fast as possible then digging new holes to lay dormant in until the next rainy season which may take more than a single year. Toads are native to most continents but Antarctica is not one of them. A few species of toads have lost their habitat and became extinct like the golden toad which populated a high altitude region in the city of Monte Verde in Costa Rica. Frogs have a permeable skin which enables them to fit in aquatic mediums and areas with a high degree of moisture. They come in a variety of colors. Most of them use camouflage techniques as defense methods and also to surprise their prey. Brightly colored frogs warn predators about the poisonous potential they represent. A toad’s skin is defining for the species. It is dry and it has small bumps all across the body. Their purpose is to serve the art of camouflage. Despite common belief they are not meant to infect people. Still, on the back of their head there are 2 parotoid glands which can secret a poisonous neurotoxin toads use to chase away predators. A frog’s feet are long and strong enabling the amphibian to make high jumps as a locomotion method. Its body is slim to make it more aerodynamic. A toad’s feet are short and are mostly used for hoping rather than jumping. Their body is wide and seems to discourage accelerated motion. 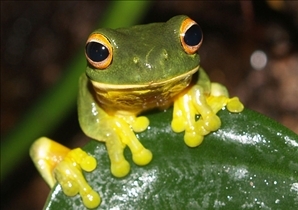 Frogs are mostly found in humid areas, while toads have adapted to dry environments. They populate almost all continents. The desert toads are a fascinating and unique example of the hardiness of this species. A frog’s skin can have various colors, bright ones usually warn predators of poisonous potential. A toad’s skin presents small bumps which serve for camouflage purposes. A frog’s feet are longer and stronger than a toad’s. The body is also slimmer and better suited for high jumping. Toads prefer to hop. Which jumper is more notorious in childrens stories?